Lasers in dentistry allow for many dental procedures to be performed with no noise, very little pain and fewer appointments. All lasers work by delivering energy in the form of light. When used for surgical and dental procedures, the laser acts as a minimally invasive cutting instrument or a vaporizer of tissue that it comes in contact with. 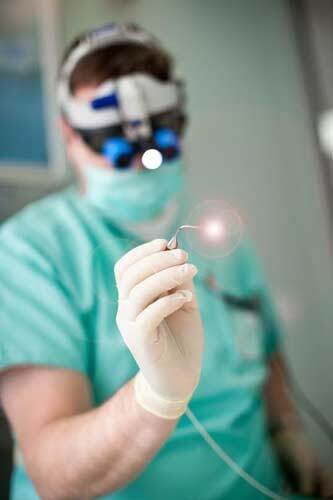 The procedures performed with dental lasers are preferable to conventional surgery. Dr. Pechak was the first in Monterey County to be certified for Laser Periodontal Therapy. The no cut, no stitches option to traditional gum surgery, known as L.A.N.A.P. It has immediate results with NO BLADES, cutting or sutures and LITTLE TO NO PAIN OR DOWNTIME. Laser Treatment which is the only protocol approved by the FDA for the treatment of gum disease, as well as being the only board certified Periodontist in the area trained with Dr Chao on the Chao Pinhole Gum Rejuvenation™.